According to a new market report published by Transparency Market Research titled “Functional Apparel Market – Global Industry Analysis, Size, Share, Growth, Trends, and Forecast, 2018 – 2026,” the global functional apparel market is expected to reach US$ 596.4 Bn by 2026, expanding at a CAGR of 6.0% from 2018 to 2026. Asia Pacific held the dominant share in the functional apparel market in 2017. All apparel is known to perform multiple functions – from aesthetics to basic protection from the elements. ‘Functional apparel’ can therefore be defined as a generic term that includes all types of apparel or assemblies that are specifically engineered to deliver a pre-defined performance or functionality to the user, over and above its normal functions. Functional apparel is defined as apparel specifically designed and engineered to ensure predefined performance requirements and functionality for the user. This includes protection under harsh environmental conditions during work or sporting activities and protection against extreme hazards and environments. In the last two decades, the apparel industry has evolved in terms of manufacturing and retailing. Global value chains in the apparel industry have been motivated by the search for cost advantages. The relocation of manufacturing from the U.S and the EU to other countries where labor is less costly is a phenomenon observed since the 1970s. Apparel retailing is also evolving due to the emergence of new markets, e.g. Brazil, Russia, India, and China and the employment of new techniques to attract consumers. In emerging markets like Brazil, the evolution and relocation of the apparel industry has contributed to the establishment of sophisticated manufacturing clusters and to the rise of big box retailers. Growing inclination of people toward individual fitness encourages them to join a gym or pursue personal training activities in order to remain healthy and active in daily life. One of the most popular technologies incorporated in training clothes, shoes, and socks is compression technology. Applying balanced surface pressure over specific body parts accelerates blood flow, increases oxygen delivery to the muscle groups being worked out, and enhances their performance. Improvement in blood circulation also helps the body reduce the piling up of body fat. A combination of these effects allows an individual to work out at a higher pace for a longer time. The comfort seeking middle class with high disposable income, changing lifestyles, and increasing urbanization has led to increased demand for functional apparel. The developing world’s emerging middle class is a critical economic and social component because of its potential as an engine of growth, particularly in the largest developing countries of China, India, and Sub-Saharan Africa. Growing demand for functional apparel is leading to increased supply of functional apparel across the globe. The apparel industry is labor intensive and requires less capital investment. Therefore, it is moving its focus toward developing countries, especially in Asia. A decline in apparel production in industrialized countries and a concurrent increase in production of apparel in developing countries indicates this. Apparel is a prominent labor-intensive manufacturing industry in Asia. By type, the footwear segment is expected to have the highest CAGR of 6.3% from 2018 to 2026. Manufacturing of functional clothing also incorporates the extensive development of replicable technologies that can provide functional support to the end-product like protection against temperature fluctuations, protection from ultraviolet light, blocking radiations, and anti-fungal, anti-bacterial properties. Asia Pacific accounted for 33.0% share of the global functional apparel market in 2016 and is anticipated to continue its dominance over the forecast timeline. The region is witnessing significant growth in the production of functional apparel due to easy availability of raw materials and cheap labor. The functional apparel market in Asia Pacific has reached a pivotal juncture. Economic and demographic transition in Asia Pacific is leading to the increased production of functional apparel in this region. 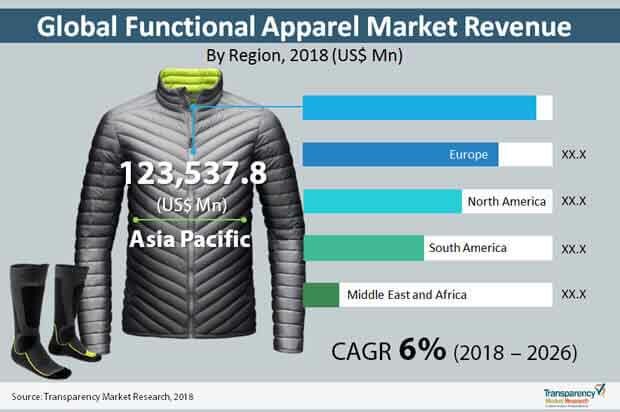 The Asia Pacific market is the largest regional market for the production of functional apparel and is expected to lead other regions in terms of growth over the forecast period. The functional apparel industry is fragmented across the world. Some of the industry participants of the global functional apparel market are Adidas, Asics Corporation, Calvin Klein, HanesBrands Inc., Head, Icebreaker, Jockey International, MIZUNO Corporation, Nike Inc., Puma SE, Russell Brands, LLC, Skechers USA Inc., Umbro, and Under Armour Inc.